Welcome to the sunny skies (hopefully!!) and the 99.9% quartz crystal sand beaches of Sarasota, Florida! 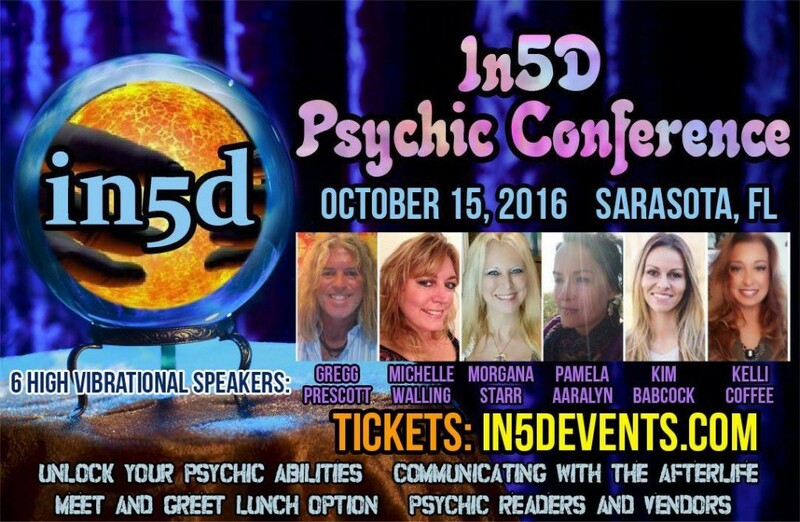 In5D is excited to announce the In5D Psychic Conference on October 15, 2016! Come to hear 6 high vibrational speakers and meet like minded people. Learn how to tap into your own psychic abilities while hearing our guest speakers tell us about what to expect in the very near future. You don’t want to miss this conference! WE ARE UNAFFECTED BY HURRICANE MATTHEW AND EVERYTHING IS ON SCHEDULE! Our Sarasota conferences sells out every year so get your tickets now! Make a weekend of it and visit the drum circle Sunday night at Siesta Key Beach. Get a psychic reading from one of our speakers, get an aura photograph, get an Akashic record reading, or let our tarot readers show you the future. Gregg and Michelle and the In5d crew will hang out BEHIND the drummers Sunday night. Bring a towel or chair and come about an hour before sunset. See you there! The drum circle is rain or shine except for major storms. There is a pavilion for cover in case of rain. We have chosen some of the hottest and most accurate psychics to be a part of your experience! Psychic/Medium Kim Babcock who channels Erik! Psychic/Medium Pamela Aaralyn one of the most accurate psychics ever! Psychic/Medium Morgana Starr angel communicator! Psychic/Medium Kelli Coffee psychic skills teacher and “Kelli in the Raw” YouTube sensation! There are only 120 tickets available for this conference. Our last conferences have sold out, so be sure to get your tickets early. NEW!!! Daena Deva– clear channel for Archangel Azrael, the Angel of Transition. In5D gifts- T-shirts, Coffee Mugs, books, pendulums, jewelry, and more! Donna Burton, akashic record reader, will not be in attendance due to illness. We send healing energies to her! It is with our deepest regrets and sympathy to report that Lisa Gregory, who was scheduled to bring you aura photography at our conference, left this 3d earth plane 9-30-16. Out thoughts and prayers are with her in the next realm and with her family she left behind. SOME OF OUR PSYCHIC SPEAKERS WILL HAVE SIGN UP SHEETS FOR A FEW LIMITED SESSIONS. Our speakers will have a table inside the conference room along the back wall with their sign up sheets. Arrive at 9:15 to sign up! Morgana Starr is doing psychic mediumship readings in 15 minute increments. Sign up first thing Saturday morning and during conference. Morgana also has a special guest joining her! Kim Babcock is doing channeling Erik readings in 30 minute increments at $50 each. Sign up first thing Saturday morning and during conference. Michelle Walling is doing life coaching sessions (intuitive starseed expert) 30 minutes at $40 each, Friday night and Sunday only. Email Michelle at michellewalling@yahoo.com to sign up for Friday. Sunday sign up sheet first thing Saturday morning at the In5d table inside the conference room. Kelli Coffee will have 15 minute increment reading sessions available through a sign up sheet. Come early to catch a spot. She will teach you how to use your psychic abilities and life coaching, but will not be doing mediumship. Pamela Aaralyn is pre-booking all readings. Please email Pamelaaaralyn@gmail.com for more info. Slots are filling up quick. You can still make your reservation through Expedia or similar or with the hotel itself as long as they have rooms available. It is not likely that they will sell completely out before the conference. The In5d rate has expired October 1. The Holiday Inn has a free airport shuttle and they will cater lunch for the conference with a hot buffet lunch (lunch is sold out). You will receive a wristband for your buffet lunch upon checking in. All tickets are non refundable.